The Clinton/Gore administration now has a concrete symbol of their foreign policy legacy. The USS Cole (DDG-67) lying in the port of Aden, Yemen, with a forty foot hole blown into her port side will forever be the icon of this administration's misguided, incompetent foreign policy. The Clinton/Gore self-serving photo-op diplomacy has served up a photo that shows beyond any doubt how dangerous this administration is to the security of our nation and the safety of our military men and women. 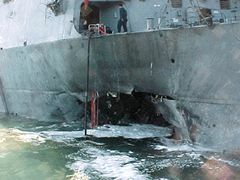 Seventeen sailors died in the terrorist attack on the Cole. Another 35 were injured. While direct responsibility rests with the cowards that perpetrated the attack, the current administration is complicit in the deaths of our sailors. The appalling judgment of the President, Secretary of State, Secretary of Defense, and National Security Advisor has led to the conditions that have allowed this disaster to occur. The president's pursuit of a foreign policy legacy has culminated in the deaths of American sailors. President Clinton now has a legacy that rivals that of former President Jimmy Carter. Carter's naivete and poor judgment gutted our military and allowed the world to perceive us as weak. The Iranian hostage crisis and the ill-fated rescue attempt were direct results of Carter's failed policies. At least Jimmy Carter's beliefs came from a moral view of the world and a sincere set of principles. President Clinton's world view extends only as far as his own reflection. Unlike Carter, Clinton has no principles, no morality, and no ethical standards. His entire presidency has been shaped by what will play well in the polls. His entire focus has been on forming some kind of legacy that will make him look good in the history books. He has failed miserably. Now that failed pursuit of a legacy has again needlessly cost American lives. The moral and ethical vacuum that permeates the Clinton/Gore administration creates a climate that confuses our allies and emboldens our enemies. This administration has made deep, untenable cuts in our military capabilities, forcing our military to do more with less. The message to our allies is garbled: We may or may not be able to come to your aid. That same message is interpreted by our enemies as a license to proceed boldly. The message our enemies receive  yes, we do have enemies  is that we may or may not be able to retaliate, we may or may not have the resources to retaliate, we may or may not have the resources to protect our interests. We are perceived as weak and vulnerable. Our weakness prompts violence against us. Paraphrasing Ronald Reagan, ask yourselves these questions: Is the world a safer place than it was 8 years ago? Is America better protected than it was 8 years ago? Is our military better prepared to meet our security challenges than it was 8 years ago? The answer to each of these questions is a resounding "Absolutely Not!" The Clinton/Gore administration has destroyed American credibility in the world. In the 1992 campaign, Clinton bashed President Bush for "coddling dictators". Since being elected, President Clinton and Vice-President Gore have indulged every communist dictator in the world, stooping so low as to accept campaign contributions from the communist Chinese government and acting as Castro's surrogate propaganda machine. Recently, the White House announced that President Clinton will make state visits to communist Viet Nam and communist North Korea. Clinton and Gore have bent over backwards to appease Yassar Arafat. Recently, it has been reported that Gore was complicit in a criminal cover up regarding Russian nuclear sales to Iran that violated the Nuclear Non-Proliferation Treaty and US federal law. American credibility has also been strained by the feeble support of our allies. During this administration, America has waffled on its commitment to maintain a democratically elected government in Taiwan. The Clinton/Gore administration has pushed repeatedly on Israel to make more and more concessions to the Palestinian terror organization. The US abstained from a vote in the UN Security Council that condemned Israel, rather than use our veto to oppose the measure. Does anyone believe that nations and groups hostile to America do not pay attention to our actions regarding our own security? Does anyone believe that our enemies do not notice our weak, insipid support for our allies? Does anyone believe that our enemies do not see that we have gutted our military? Does anyone believe that our enemies do not see how we have undermined the morale of our soldiers and sailors by the social engineering being conducted on our military? The Clinton/Gore administration is either incredibly stupid or dangerously pollyannaish. The State Department recently renamed "Rogue States" to "States of Concern", as if by changing the name we have somehow, magically changed the motivations and intentions of those hostile to American democratic ideals. National Security Advisor Sandy Berger stated that the administration realized there would be increased risk in having US warships refuel in Yemen. Despite the increased risk of terrorist attack, the administration decided to go ahead anyway. There was no risk to Sandy Berger, or Bill Clinton, or Al Gore, or Madeleine Albright. All the risk falls onto the shoulders of American service men and women as they struggle to fulfill the incomprehensible missions to which they are assigned. To Sandy Berger and the other Clinton/Gore sycophants, military people are not flesh and blood men and women; they are disposable, expendable objects on top of which the administration will build the president's legacy. Using our ships to "show the flag", to signal our support for our friends is a legitimate peacetime mission for our Navy. But that mission must be tempered by good judgment. That judgment was clearly missing. USS Cole was sent to Yemen despite intelligence reports that a terrorist attack against one of our ships was likely. Were these intelligence reports made available to the fleet commanders that control the movements of our ships? Were these reports made available to the Commanding Officer so that he could take appropriate security measures? USS Cole was sent to Yemen despite the fact that Yemen is a haven for terrorists. The current government of Yemen is unable to control the terrorists within its borders. Despite this, we entrusted the security of our ships to the Yemeni government. Two years ago, Yemen was listed by the State Department as a State Sponsor of Terrorism. Now, because the current leader of Yemen wants to develop closer ties to the US, the Clinton/Gore administration has abandoned prudent security measures and declared Yemen an acceptable place to send our ships. Developing closer ties with Middle Eastern governments may be a worthwhile pursuit, but it does not warrant placing our people in danger. The blood of American sailors is on the hands of the Clinton/Gore administration. The narcissistic, incompetent, dangerous foreign policy of this administration killed those 17 sailors as effectively as if our current leadership had detonated the bomb that blasted the hole in USS Cole's hull. As we Americans ponder our choices in the coming election, we would do well to consider what eight years of a Clinton/Gore administration has done to our national security, to our credibility around the world, and to our military readiness. Go to the US Navy website at www.navy.mil and look at the pictures of the USS Cole. Look closely at the gaping hole in her port side and think of the sailors who died and those sailors who fought to save the ship. That fractured hull is the Clinton/Gore legacy. Our military people are the finest in the world and they risk their lives daily to protect our way of life. Our military isn't hollow: The Clinton/Gore administration is. © 2000 Charles Bloomer. Charles Bloomer is a retired US Navy submarine officer and a senior writer for Enter Stage Right. He recently appeared on Ken Bagwell's "Heads Up America" radio program on WTZY in Asheville, NC. Mr. Bloomer can be contacted at clbloomer@enterstageright.com.